When I was a young girl, my father was a pastor in a Mennonite Brethren church in northern Saskatchewan. We grew our own vegetables, and reluctantly, my mother received gifts of sausage and flour from the parishioners, intended to supplement my dad’s slender salary. Mother turned my father’s old winter coat into jackets for us girls. On summer holiday, we went to visit some church people that lived even farther north than we, near the end of where the road goes. Past gentle hills, rocks, and stunted fir trees, we finally turned into the laneway of a very rough house. While my mother and father talked with the people in the house, I sat in the back seat of our brown 1953 Chevy, my legs hanging out of the door, my bare feet in the dust. Bored, I pulled out a slab of Macintosh’s toffee which I had been sucking on all morning, and commenced to licking on it again. A young girl about my age came out of the house and looked at me, as I licked and licked my toffee bar, all creamy and buttery and sweet. She didn’t say anything, but stared fixedly at my toffee. I didn’t say anything, either. After about fifteen minutes, my parents came back to the car, and we drove away. I puzzled over this idea, of sharing. I felt very strange, thinking that this girl was even more poor than I, that she might consider me rich, with my huge slab of Macintosh’s toffee. The idea of being generous also was very novel. I was comfortable with being the recipient of generosity: wearing my cousin’s old clothes, eating food at the table of a well-to-do neighbor after Sunday dinner. Since then I have learned to be more at home with giving. Our minister at the New Hope Community Church in London, Ontario, Greg Wyton, introduced us to the concept of tithing, and George Kinder taught us the Aloha spirit at a weekend workshop at Kripalu Retreat Center. My husband and I set up automatic deductions from our bank account for our church, environmental and spiritual groups, Geez magazine. My husband and I looked very closely at living in the common purse model, by living for almost a year in a household at Reba Place Fellowship, an intentional Christian community in Evanston, Illinois. During that time I discovered that sharing to that extent was more than I was willing to subscribe to. But we were being called by the words of Jesus, “If you want to be perfect, go, sell what you have and give to the poor, and you will have treasures in heaven; and come, follow Me.” But does that mean that we should literally sell everything we have and give it to the poor? Is it possible for me to live without attachment to material things? I really l*o*v*e my Amish-built Mission-style oak dining table, around which twelve people can sit comfortably on matching chairs. What does “everything we have” mean? Who are the “poor”? What does it mean to have “treasures in heaven”? Should we “give until it hurts” or “give from a full cup”? So these are the questions I am living with, right now. This entry was posted in Joanna Wiebe's life and tagged generosity by Joanna Wiebe. Bookmark the permalink. Really a fine thread of thought to be pondering these days. I’m not sure I have an answer to your questions either but it is something we spend a lot of time thinking about around here. 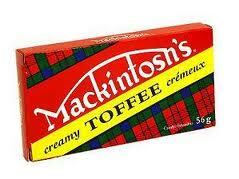 I did want to share a happy memory that was brought up just by looking at that toffee. A female neighbor that lived in the next trailer used to invite me over for the very same toffee. We were also poor and that was quite the treat! We would sit and talk to each other just the two of us. I always thought I was the one receiving but found out later that she always wanted children but felt she couldn’t due to her alcoholic husband. I suspect that our time together was mutually gratifying. Either way I cannot see that box without feeling a warm sense of joy.